Argentina didn’t cry for me, but I certainly cried after realizing I couldn’t bring home any of the beautiful bottles of Malbec I bought in a hip little airport bodega, all because my bags had the good sense to make the flight and were, at that moment, Lima-bound without me. I’m sure by now my Argentine cousins have put those bottles to good use, their prize for rescuing me from the prospect of spending the night on the floor of International Terminal A. Imagine my nostalgia-ridden joy when I stumbled across a gem of an Argentinian eatery in Los Angeles. 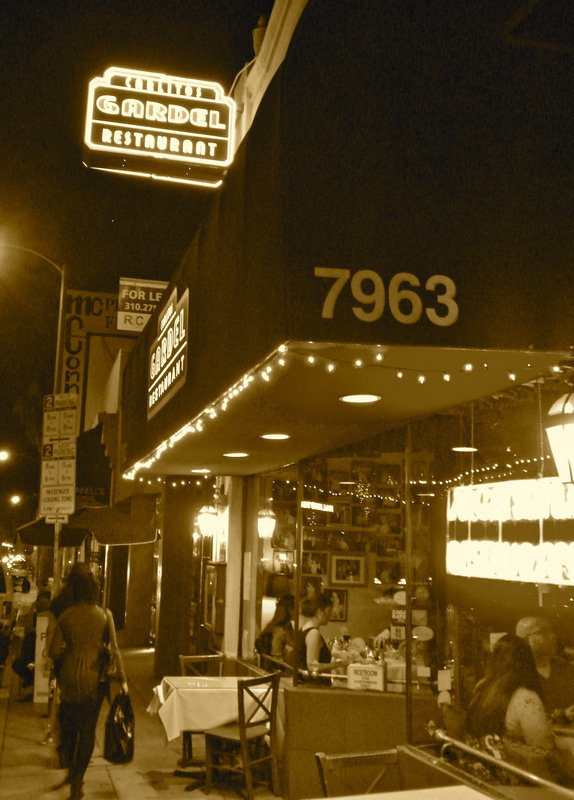 Carlitos Gardel Restaurant sits on a nondescript stretch of the tourist mecca that is Melrose Avenue, about halfway between the stuck-in-the-the-80s boutiques and the posh Beverly Hills end. For those of you who may not be familiar with Carlos Gardel, you’ll certainly know who he is about five minutes after stepping into the restaurant’s retro-elegant interior. Framed reprints of newspaper clippings and old photographs line the walls, telling the story of one of Argentina’s most beloved musical figures, known to some as the godfather of tango music. 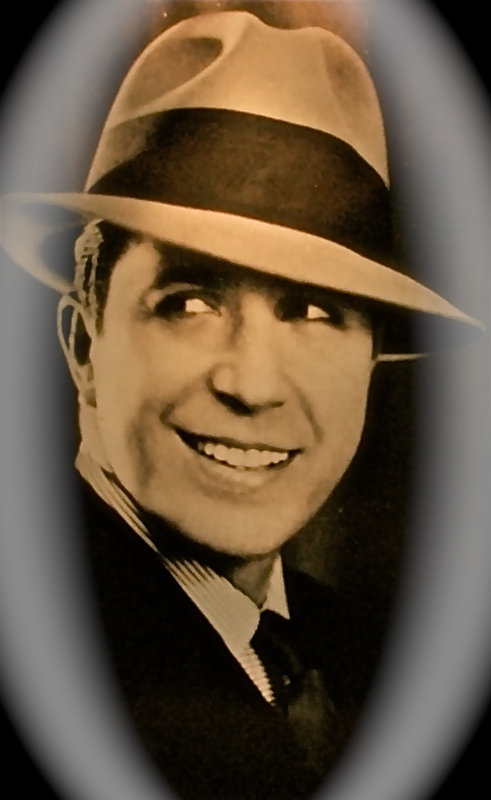 Tango Bar: An image of Carlos Gardel taken in a Buenos Aires milonga, or neighborhood tango hall. Sultry tango rhythms drifting in from the audio system serve as a fitting soundtrack for a menu of traditional Argentinian dishes: Empanadas, melted provolone and steak classics including milanesa, entraña a la parilla and churrasco. Signature Italian influenced-plates feature gnocchi, ravioli and seafood pasta. The wine list is curated by the restaurant’s Buenos Aires-born sommelier, who is at the ready with helpful advice and pairing suggestions. I decided to take a break from Malbec and try what in my opinion is Argentina’s true wine star, Bonarda. This is a red grape with a wonderfully fruity character and a smooth feel on the palate. I chose a 2007 Lamadrid Reserva Bonarda. Gorgeous violet aromas, a hint of chocolate and lots of ripe red fruit. In a word, ¡Fantástico! 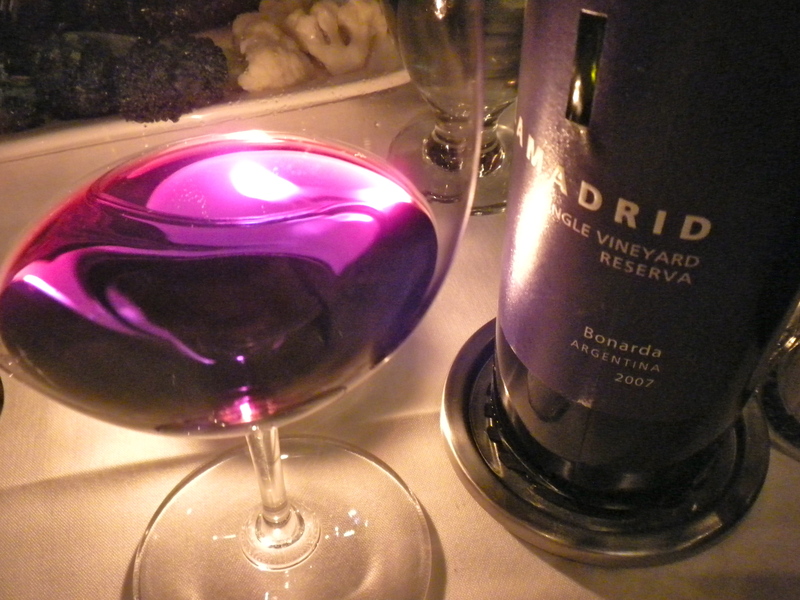 Next time you're in the mood for Argentine wines, give Bonarda a try. 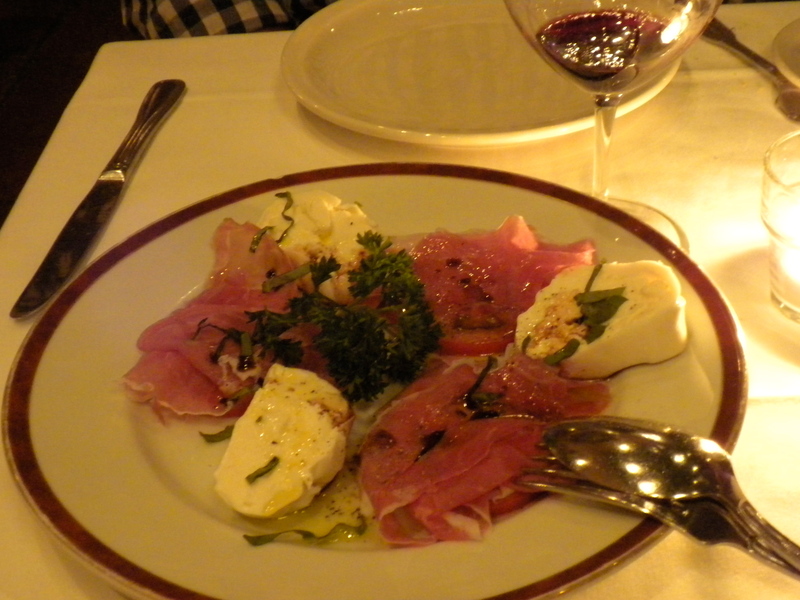 Bonarda was the perfect match for my Italian-influenced appetizer of burrata and prosciutto. 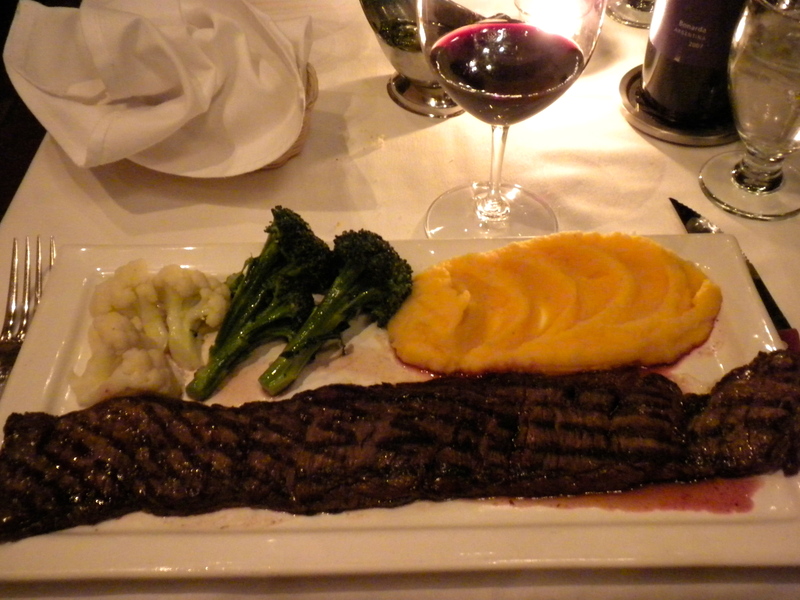 The wine’s flavor and structure also complemented the main course, entraña (grilled skirt steak) served with pumpkin-infused mashed potatoes and steamed vegetables. Mamma mia! An influx of Italian immigrants to Argentina starting in the mid-1800s gives the nation's cuisine a decidedly Italian flair. During my first trip to Buenos Aires, my cousins took me to a tango dinner theater where I proceeded to consume a juicy steak about the size of a coffee table. This, of course, while watching lithe dancers flit about the stage in spangled, form-fitting dresses. It’s a good thing my gym doesn’t have a branch in Buenos Aires, because I probably would have spent the next 24 hours on the treadmill. The portions at Carlitos Gardel are more than generous, much like every restaurant I tried in Argentina. This time, I showed some restraint and had enough leftovers for two more meals. Dessert at Carlitos Gardel is the best incentive not to go loca on your main course. The peach layer cake with dulce de leche and whipped frosting is like nothing I had in Buenos Aires. The great thing about that is knowing I can enjoy it without having to board a plane – and risk missing another connection. Carlitos Gardel Restaurant. 7963 Melrose Ave., Los Angeles, CA 90046. 323.655.0891 Dinner M-Sat, 6 – 11 p.m.; Sun, 5 – 10 p.m. Lunch M-F, 11:30 – 2:30. Great post! Those Buenos Aires meals look amazing. Thanks for reading! I will check out your food post. Cheers! I have to try this place! 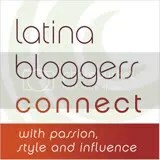 Melrose tiene muy buenos restaurantes, tambien te recomiendo Lala’s es fantastico!! La comida se ve deliciosa y el ambiente maravilloso! Gracias, Natalia! Tendré que ir a Lala’s. Thank you! I’ve been looking for an Argentenian restaurant recommendation to take my hubby on his birthday. We will definitely try this one. My pleasure, Ericka! Let me know how you like it. ¡Provecho! Love how you missed your flight because you were shopping! I would never do that. Too paranoid about being without my luggage for to long lol. And Bonarda…is it purple?! Looks so yummy and interesting! Embarrassing to admit, but yes, I blew my flight while trying to spend the last of my Argentine currency! You should have seen the looks on the LAN Airlines flight attendants’ faces as I feebly tried to explain…On the Bonarda, the purple color was enhanced by the candle in the background, so in real life it’s not that purple. A wine’s color comes from a combination of the amount of time it’s left in contact with the skins while it ferments, its age and added color from other types of grapes that may have been blended in. Youthful red wines tend to look more purple, while older reds will take on a brick-like hue. In this case, 2007 is still fairly young, so that’s why you would see more purple than garnet. If you do try it, I’d love to hear what you think! LOVE IT! I love South American food and wine. I am biased since I am from Paraguay but your post took me back! Glad you enjoyed the post! I’ve never had Paraguayan food – is it similar to Argentinian cuisine? But the food looks great and I’ll be sure to look out for the wine selection. Wow loos fabulous! what a great find!